« Journal In A Jar: What about your family makes you happy? (S) John 10:40-42 40 Then Jesus went back across the Jordan to the place where John had been baptizing in the early days. There he stayed, 41 and many people came to him. 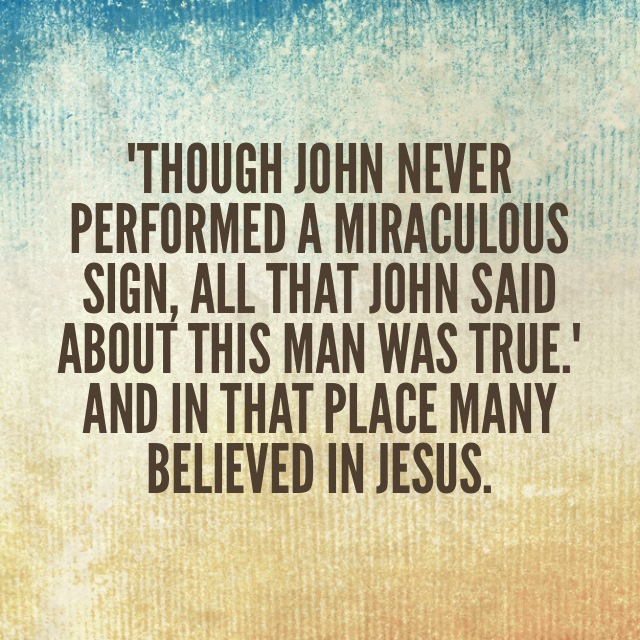 They said, “Though John never performed a sign, all that John said about this man was true.” 42 And in that place many believed in Jesus. (O) Jesus was teaching in Jerusalem when again He was asked to substantiate His claims the He was The Son Of God. He explained that His miracles where from the hand of God. He used scripture to back up His actions. The leaders were not pleased and intended to kill Him. Jesus slipped away and headed back to where it all started. He headed back to the Jordan. Jesus stayed there a while. Even after his death, John The Baptist’s words rang true to the people who followed him. He set the stage for Jesus’ coming and, because he was such a trusted man, his follower’s believed these words in John 1, 29 “Look, the Lamb of God, who takes away the sin of the world! 30 This is the one I meant when I said, ‘A man who comes after me has surpassed me because He was before me.’ 31 I myself did not know Him, but the reason I came baptizing with water was that He might be revealed to Israel.” Thought Jesus never performed a miracle there, the people believed. It had come full circle. (A) John the Baptist answered the call that God placed on his life. He could have taken advantage of the ears that heard and claimed to be the Messiah. He could have amassed so many more followers. He could have said what pleased the leaders and probably would have become a very rich man. Instead he spoke truth. He never claimed any thing more than this. “23 John replied in the words of Isaiah the prophet, ‘I am the voice of one calling in the wilderness, ‘Make straight the way for the Lord.’ 24 Now the Pharisees who had been sent 25 questioned him, “Why then do you baptize if you are not the Messiah, nor Elijah, nor the Prophet?” 26 ‘I baptize with water,’ John replied, ‘but among you stands one you do not know. 27 He is the one who comes after me, the straps of whose sandals I am not worthy to untie. '” John’s testimony did not change during his entire ministry. His words rang true and his credibility stood firm. He lost his life because of it. He died having completed his call. Am I doing what God has called me to, or am I spending my time doing everything else? Do I speak words of truth that draw people to the person of Christ? (P) Dear Lord, Thank you for sending Your Son to die for us. Thank you that we can come before You humbly and ask forgiveness because of the sacrifice of Jesus. Please help me to see exactly what You want me to complete here on earth. May my words and actions be ones of truth drawing people to the Grace of Your Son, Jesus. Amen. Figuring out life in the 808. Worship leader, homeschooling wife and momma to a family of artistic theatrical dreamers who strive to live in a house of praise.